Hartzell’s Product Support department regularly conducts training classes for aviation professionals at our corporate headquarters in Piqua, Ohio. 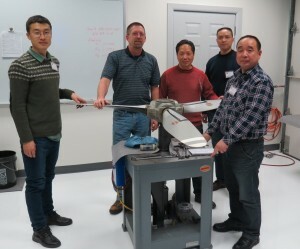 Recently, four students from the Civil Aviation Flight University of China (CAFUC) spent a month in Piqua learning to overhaul Hartzell propellers. CAFUC is the world’s largest flight training institution with over 16,000 students and a fleet of 300+ aircraft – many of which fly Hartzell props. CAFUC has recently taken delivery of a fleet of new Cirrus SR20 aircraft equipped with Hartzell propellers. As members of CAFUC’s maintenance staff, our students are responsible for the overhaul and repair of all propellers in the CAFUC aircraft fleet, including the new Cirrus SR20 aircraft. Hartzell put together a team of experts to provide our students with thorough training in the overhaul of the Hartzell propeller installed on the Cirrus SR20. The CAFUC students gave our Hartzell team high marks for the training they received. They were impressed by the passion and dedication shown by every single Hartzell instructor and technician who contributed to their training. Our regular training schedule offers classes for our full range of products to accommodate the needs of aviation maintenance professionals. Class duration depends on the subject; usually three to five days.